When I was at the Calvin show in Milan last time, just as a goof, I went to see if my painter friend was still around the neighborhood. I was surprised to see that he was in almost the same spot as last time having lunch with his co-workers. I walked over and I didn't need to say a single word - it was like he had been waiting all day for his turn. We don't speak each others language, I don't know his name and yet it is like we are old buddies. What could he possibly be telling his wife that morning? " Yes, I have to have my portrait taken today by a crazy American soooooo I will choose my navy vest and Orange nylon fannypack!" He will definitely be getting a few prints next summer in Milan. Comments on "Old Buddy!, Milan"
Ha! Lovely mix of blue and orange. I love that he was in the same spot too. Molto bello! He glows! True style, no labels, no mags, just real. Wonderful stuff. this guy rules! great style is all in how you work it, yes? rock that fanny pack! oh sart, you are one talnted man! this is my favorite post to date. He is just too cute. Makes me smile. Gotta love the Italians. La dolce vita. I love your spirit, Sart. Truly. Your attitude toward your subjects has to have as much influence on your photos as the subjects themselves. I think that "certain something" we all love about your photos but can't quite put our fingers on is you. 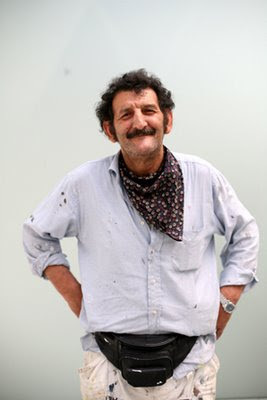 ITALIANS , also if they're just simple wall painter, have an unpretentios and natural elegance that it's almost impossible to achieve from the current generation of americans, always not spontanious and too study in their looks, so defently stiff! Charming, endearing--almost a caricature of the Italian painter. Enjoyed seeing and reading. and that´s thanks to the communication between two artists! Good guys, both of you! he is fantastic and so is this blog! I loved the first edition of this Italiano and the second is even better. In 1995 I was traveling with my family in Rome. We were leaving St. Peter’s and just outside was a group of men, plasterers or painters in splattered and spotted work clothes, sitting on the curb eating their lunch. Each one a deadringer for Paul Newman, Al Pacino, or Marcello Mastroianni. As I tried to avoid gawking at them, my daughter, then 8 years old, whispered to me “those men are all really handsome, mommy.” Even a child could see this was a rare collection of men. Beyond their natural good looks, they were also very self-possessed. It was striking to see how in comparison to US laborers, they were very confident and easy in their ways. Italians just got it goin’ on! your pictures are always so nice. usually i am inspired by the sophistication and refinement of the subject. This man though, he is just beautiful and perfect and he outshines everyone else! How cool! Maybe you could learn a few phrases of Italian by next year, at least to ask his name and tell him yours. He looks like he might be a very animated character. We don't speak each others language, I don't know his name and yet it is like we are old buddies. i dont care what anyone says. i will always love bright colored fanny packs. and yes this guy has to be one of my favorite characters from your whole blog list. He looks like a nice man. It's a talent to be able to take a photograph like this. People don't really respond to a lens but to the photographer. Keep going and August Sander will have nothing on you. That's such a cool picture. I've always been a big fan of fashion and style (even though it took me a few years to get my own style in gear). So it's always nice to come across sites that cover style, fashion and how it can be such a big part of our lives. these clothes will undoubtedly end up as Double RL vintage on Mott and Prince at prices we can only stare in disbelief at. honestly, i think i might be in love with this man -- such a pleasure to see him again. This guy is my favorite Sartorialist "regular." What a face!! Nice! I can imagine the smiles in both of your faces when meeting... He has character, a crucial underlaying element of style. Painting houses in my student days I remember loving how the paint colour from each successive house added a new element to my workwear. He just looks so natural, with that mustache and all. Kinda makes me all happy, just looking at the picture, made me smile too! Reading the comments I am getting a little angry! I know that this blog is about clothes and fashion, on the other hand I like that Sart also shares with us some personal memories or stories as well. 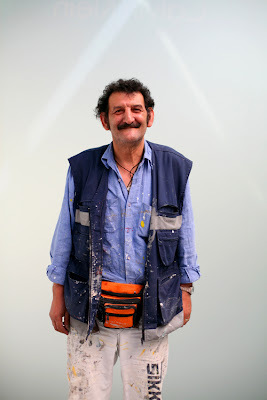 This case it is a simple (though very simpethetic) painter in working clothes!! And some comments are somehow, perhaps I cannot express myself well, but they are just fake. Sart, you really took the photo because of the "lovely mix of blue and orange and the fanny pack, and because of the italian fashion and style comes out of this pic???? Next time if you show us your favorite cleaning personal somewhere, than will we receive comments about the nice cut of the overalls? Sorry from everyone, but it just came out. This man gave me the confidence to wear silk scarves bushranger style. He is fantastic! I love it when you shoot ordinary "uncool" people. Thank you Sart, you and your buddy really saved my day. Hah, I KNEW bumbags (funnypacks) were coming back! Molto bello indeed! You made me break out in a silly grin at my desk this morning. Grazie. I took the photo not because of the clothes but because he glows! This photo is like an unexpected present on a gloomy day! What a great way for me to start a Friday. Thanks, Sart! I am sorry that you, as a person assumedly interested in style and appearance, do not see the it in these lovely portraits. They are striking – and maybe just a little disconcerting – just because they so clearly show that personal style, and our perception of it, is only to a limited extent a result of cuts and materials. God knows how many people I have seen here in Manhattan who shell out thousands of dollars on their wardrobes and still look like they are constantly on their way to an audition for some photo shoot, believing themselves to be looking out from Mount Olympus, while their anxiety and eagerness for acceptance seeps through the gilded façades. And then, someone like this man comes along, uncomplicated and unforced in his approach to his appearance, minor details showing that he cares, but nothing overpowering the sense that he is at peace with his station. And while his outfit may be copied and bought, the contentedness cannot. Precisely that is the importance of these portraits in a context such as this. Looks like as if his face was photoshopped into that second pix. Damn! That goofy smile rocks. I love shots like these, of ordinary people.. showing the thought they put in their appearance. There is something very personal in the relationship of a person with their clothes..Very inspirational... that is, when I actually notice it. These visual gems are everywhere, but it takes an open mind to see them. aww..this entry just made my day..
That The Sartorialist has captured the essence of style in this man's utilitarian look truly makes this a wonderful photograph for this website which is all about detail. To top it off, The Sartorialist captured the man one year earlier in a similar outfit simply proving that one man's personal style is intricately linked to his daily life. Plus, in each shot, this man, whose name we do not even know, seems to be reaching out toward the audience behind the lens. That is what makes this series so intriguing to me. And I will keep reading this blog so that I may see more people like him. In addition, I await the day when The Sartorialist will surprise us with yet another photo of this man so that time and space will be reduced and we may react with the kind of joy usually reserved for old, old friends. This blog makes me proud to be both a humanist - and a stylista. I love this guy... his face speaks volumes of character & that he enjoys life & living... Great pictures.. I just have to say I love this guy so much! I always loved that first picture and it's so great o see him again! It's so nice how you appreciate characters like him, rather than simply the the impossibly thin fashionistas we see everywhere else. if this blog were merely about fashion it would not have such a loyal and devoted following. it is about so much more: character, panache, intelligence, ease, confidence, creativity, individuality, art, photography, life. do you really look at these fascinating people in these wonderful shots and just see clothes? and more importantly, is that all you want? There are people in the world who don't have the money to use Vogue or L'Officel as a catalog. There are folks who don't care to shop H&M and Zara to look like the folks on Style.Com...they just don't find it important. Does this mean they don't have style? Trust me doing either is neither, it's a cheating in fact. Style is something that...comes with having confidence and pride in what you do...whether you're cleaning toilets or editing a fashion magazine. Furthermore, how do you think this fashion world is supported. There are people who clean the toilets at the Barneys you shop at, people who drive the magazines (in trucks an cargo planes) that you look at, paint the catwalks you watch from the sidelines, and they are just important to the process as the Anna Wintours....probably more so. And yes they have style...every human does...you just have to look for it. Aw. I like picturing you meeting again with your buddy. The recognition and the mutual admiration! I think a good-hearted boy from The Midwest is welcomed 'most everywhere. We enjoy seeing all your buddies. Next up? I suppose at the Spring Fashion Weeks. hen? the old diver in Paris! We haven't forgot you promised to meet him in October. just to tell the painter's name's Demetrio and if I'm not wrong he must be originary from southern region of Calabria. oh, just his face just makes my heart sing. Huge, huge style. I love you for taking this photo. Of course it does make me wonder if you are going to show up at my house when my hair is in those pink foam curlers and I am wearing the husband's pants and grandmere's apron, in the act of installing a fresco on the kitchen ceiling. Thanks. Now I live in fear, but happier that Mr. Blue and Orange is working the style for all of us. I love him so much! He is just plain precious! Wait! It's the same fanny pack as the year before: got orange paint on it. His smile is so sweet, it actually made me cry!